Using unusually rich (for transition economies) follow-up survey data and propensity score matching techniques, this paper seeks to increase our knowledge on what active labor market programs (ALMPs) work in South-East European countries by providing estimates of the effects of four ALMPs implemented in Romania in the late 1990 s. We find that three programs (training and retraining, self-employment assistance, and public employment and relocation services) had success in improving participants’ economic outcomes. In contrast, public employment was found detrimental for the employment prospects of its participants. 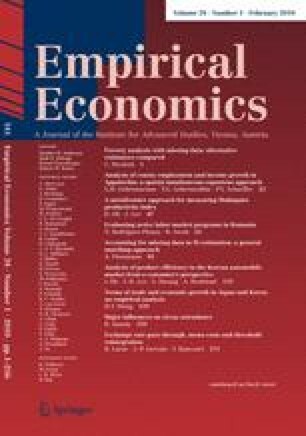 Our sensitivity analysis also finds evidence that, in the case of training and retraining, self-employment assistance, and public employment and relocation services, operators “cream off” the most qualified candidates among the unemployed; whereas public employment seems to be used as a regional policy by “bringing work to the workers”, that is, creating jobs in high unemployment regions. The online version of this article (doi: 10.1007/s00181-009-0256-z) contains supplementary material, which is available to authorized users.